Find hotel near Jambangan Bali Cooking Cl ..
Bali is popular for a lot of things and one thing that cannot be missed is the traditional food. 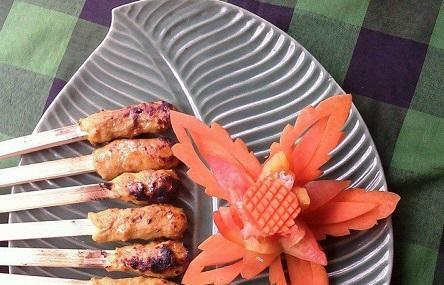 If you might be interested in learning how to cook delectable Indonesian delicacies, opting for the Jambangan Bali Cooking Class would prove to be a pleasant experience. The very first thing that you would do is visit the market where you can pick spices, herbs, meat, vegetables and much more. Upon returning, you would get to learn to cook Balinese cuisine in a Balinese house with an equally beautiful setting. Once done cooking, you can relish what you have made in their splendid garden. This truly is one of its kind experience and you are sure to love it. A truly valuable experience - a walk through the traditional market to pick up the ingredients with Putu, a warm welcome into a family home with beautiful Made, who graced her lovely company with us, taking us step by step of the dishes we made. The aroma, the sounds, the seamless transitions, cooking and eating with other travellers - I can’t recommend it enough! Great experience! Very warm and welcoming family, very good to experience the ‘Bali’ life. Dishes were fun to cook and tasted great. Thank you so much. Highly recommended! Great hosts, well organised and ran. The class was lots of fun and the food was delicious and very filling! Little expensive relative to the area but when you factor in 9 courses it’s great value for money! Great cooking class! I really enjoyed making traditional family meals. I’ve taken part in a few cooking classes, but this one is the best. I know I will be making these dishes. Sooo yummy and you’ll leave stuffed!